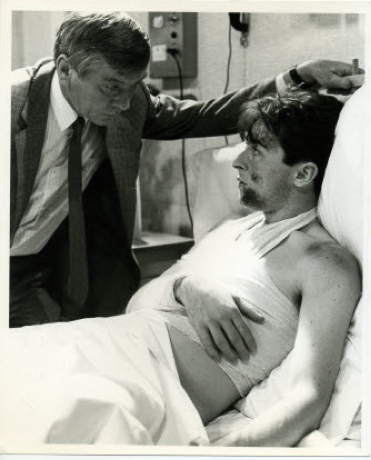 Taggart, was my first big TV role. I played Jamie, a boy who works in a chemist's shop who is wrongfully suspected of murder. Taggart was the name of the Glasgow detective played by Mark McManus, and the show is still running in the UK. I was so excited when I got this part. It was the first time I had done any real acting on TV, and it was the beginning of quite a run of shows I did for Scottish television. I remember finding it really hard to play a young Scottish boy because I'd just come out of drama school and had never played any character in my own voice. The thing about being the chief suspect in a Taggart in those days was that everyone knew you couldn't really be the murderer because you were being focussed on too much and given too much screen time. Eventually in the last part of the third episode the chief suspect would be exonerated and there would be a mad dash to catch the real killer, who of course had been featured in the previous episodes but you were lead to believe he (or she in my case) was a red herring.